Would you dare gaze upon me? burn in the fire of knowledge and beauty. After a long nightmare of sun, sand, and misery, Alhazrad stumbled inside the gates of a ruined city. The ancient demoness Ereshkigal greeted him and restored his strength with words of healing and honeyed wine of no mortal vineyard. 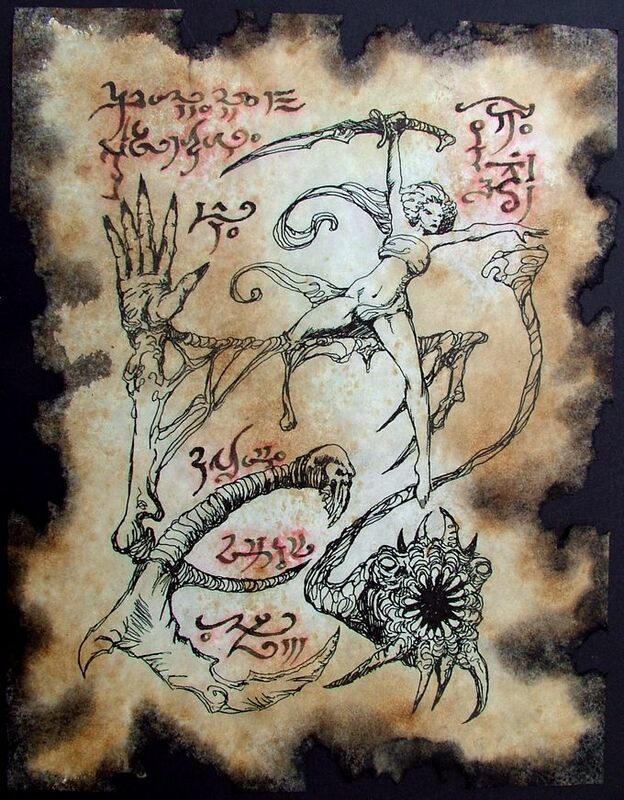 In return she bade Alhazrad to remove the hundred binding runes that the Elder Gods had written upon her flawless body. The glyphs held her to the dead place, punishment for the abominations she had led her worshippers to perform in primal ages. Fearing the wrath of the Elder Gods even more than the seductive demoness, Abdul refused . Ereshkigal offered to trade him knowledge of many unspeakable demons for her freedom. The mad arab's lust for arcane secrets overcame his fear. He agreed and bade her speak. For two days and nights Ereshkigal sang to him. 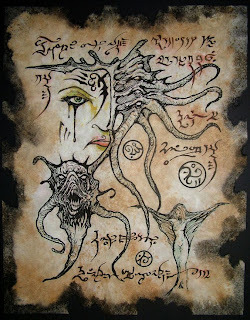 Her songs were older than mankind, they told tales of the Great Old Ones; Tsathoggua, black toad of the abyss; Yig, father of serpents; Ahruman, who is called the lord of corruption and Pazuzon who breathes the black wind that kills men and beasts; even whispering of Yog-Sothoth, who is the gate and the key; of all these and many others she sang . By the third day Abdul could bear no more as his brain seethed with things no mortal should know, he begged the demoness to be silent. 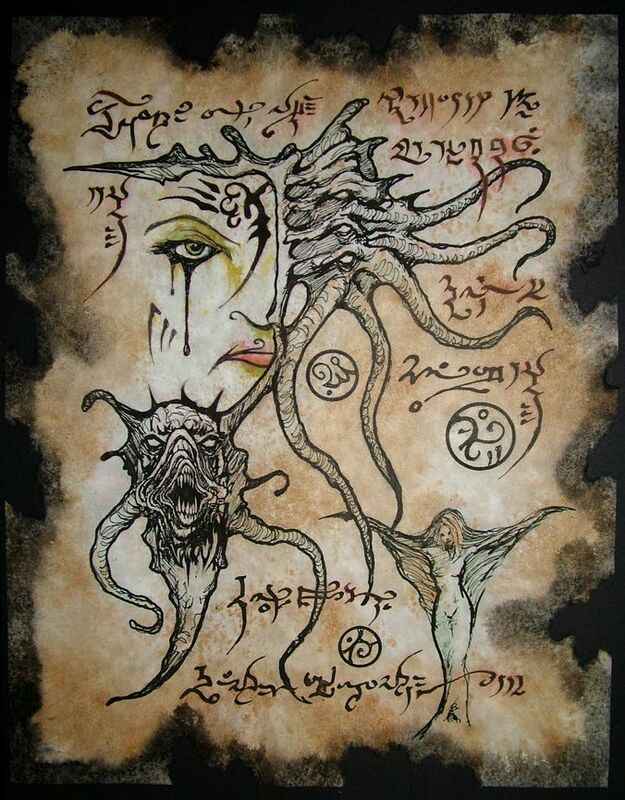 Then Ereshkigal demanded her payment, she gave Alhazrad ink and quill that he should mark through the runes that held her to a dead and forgotten place. But he betrayed the demoness, inscribing yet another binding to her perfect skin and then fleeing for the city gates. Ereshkigal's voice turned to a roar of curses and she prophesied that the knowledge she gave Abdul would lead to his terrible demise. Alhazrad stole a single glance over his shoulder at the horror the Ereshkigal had transformed into. Then he ran harder, praying his heart would burst and save him from the memory of what he had witnessed. Alhazrad was found days later by a caravan, screaming at shadows and frothing like a mad dog. 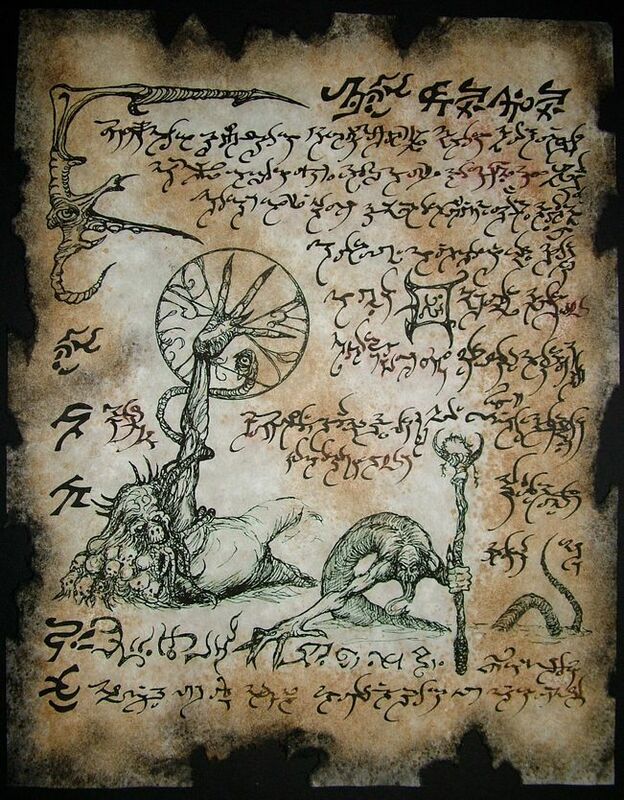 When he recovered his sanity, Abdul put to paper all he had learned from Ereshkigal. Secrets that would eventually reward him only with madness and pain.